It’s two days after the 44th anniversary of the Apollo 11 moon landing and eventual transformation of the moon into mankind’s toilet/golf course in the sky, but we’re not done celebrating just yet. The fabulous people at Jalopnik posted a slew of pictures from the Apollo 11 mission that stray beyond the shots you’re used to seeing of the historic event. The photographs come courtesy of the snap-happy Neil Armstrong and Buzz Aldrin, who made themselves familiar with cameras throughout the mission. And why wouldn’t they? 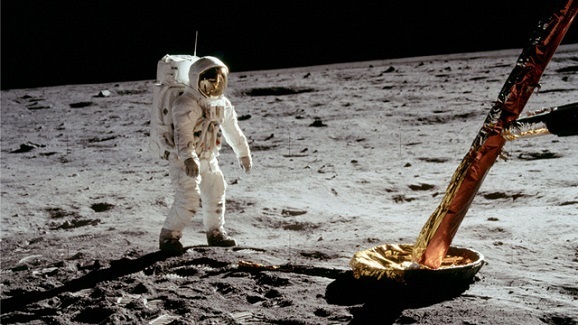 People inundate social media with images of the cupcakes they’ve made and how their dogs look while they sleep with their legs in the air, so it’s only natural that humanity’s greatest achievement in space would warrant a couple more shots than just the moon man and his flag that became MTV’s logo so many years ago. The pictures are in high definition, which gives them all stunning depth, but I’m sure conspiracy theorists would also say they look more staged than ever. But these life trolls should probably look elsewhere for like-minded nuts. Take a peek at a few more below, and hit the link for more. The only things I’ve ever gotten from the bottom of an ocean are leg wounds from being whisked along jagged rocks. 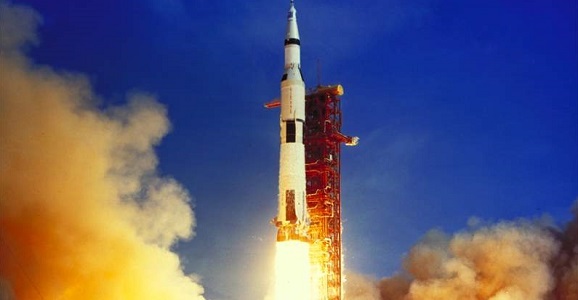 Amazon CEO and mega-bazillionaire Jeff Bezos and his company, Bezos Expeditions, have confirmed via press release that the rocket engine parts found at the bottom of the Atlantic Ocean are indeed the same ones that came from the Apollo 11 Saturn V rocket that made history in 1969. Well, I guess the astronauts aboard the shuttle were actually the ones to make history, but that’s splitting hairs. Back in March, the Expedition team recovered a sizable number of wrecked and warped pieces from two F-1 engines that were known to be from one of NASA‘s heyday missions. At the time it couldn’t be determined which one they were from, given they sat three miles beneath the surface of the ocean for over forty years. After some restoration efforts, the pieces were scanned with a black light and special lens filter, and that’s when they found what they were hoping for: the number 2044 stenciled into the side of a thrust chamber. 2044 is the Rocketdyne serial number that matches up with NASA’s serial number 6044, which is the very same one that corresponds to F-1 Engine #5 from the Apollo 11 mission. There aren’t a whole lot of associations between the Space Age and luxury. Even though tons of money has gone into space exploration over the years, most of that funding has gone into research and development. And until I pimp out my Accord with Curiosity Rover wheels, it looks like we’ll have to turn to the Forbes Galleries to find our story. From March 16-September 7, 2013, New York City’s Forbes Galleries will host the “Out of this World! Jewelry in the Space Age” exhibition. 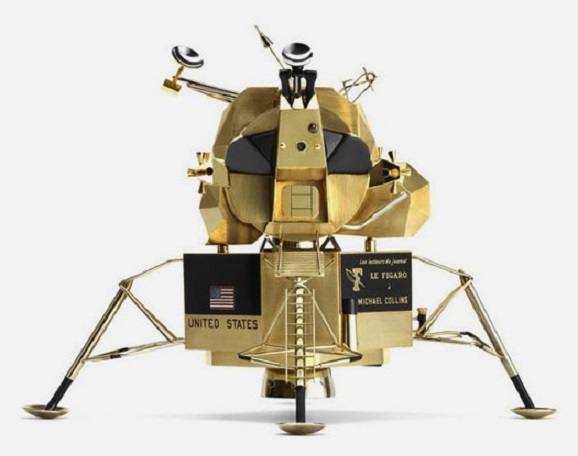 Three of the event’s highlights are solid gold replicas of arguably America’s greatest success in travel history: the Apollo 11 spacecraft. Each one is a nod to the Apollo astronauts of Neil Armstrong, Buzz Aldrin, and Michael Collins. I can’t think of anyone who would want to honor me with anything made out of gold, except for this goose I keep locked up in a spare closet. At that time, the most dangerous part of the moon mission, was getting the moon module back up into orbit and join the command ship… But if they couldn’t , they would have to be abandoned on the moon, left to die there. And mission control would have to close down communication. The men would either starve to death or commit suicide. If you were a billionaire, what would you do with that money? Most of us would say something like, “Pay off my student loans” or “buy a fancy car” or maybe “travel the world.” But not Jeff Bezos. Bezos, billionaire entrepreneur and Amazon CEO, is spending his own money excavating the long lost F-1 engines that were used to propel the Apollo 11 mission into space, a mission that eventually took the first humans to the moon. Bezos posted a letter to readers on his own site, BezosExpeditions.com, explaining his love for space exploration and science, stemming from the very mission he’s hoping to resurrect from the depths. At age 5, he watched the launch and moon landing on television, and from then on he was hooked. Now at age 48, he’s spending part of his $18.4 billion fortune to bring a part of his childhood back into the world.